Steele Divitto was pretty much born to be a football player. Growing up in New Jersey, Divitto found his way to the game when he was 12-years-old. Almost immediately, he found his way over to the defensive side of the ball where he would become a star player — first at defensive end and then at linebacker — for Don Bosco Preparatory High School in Ramsey, New Jersey. 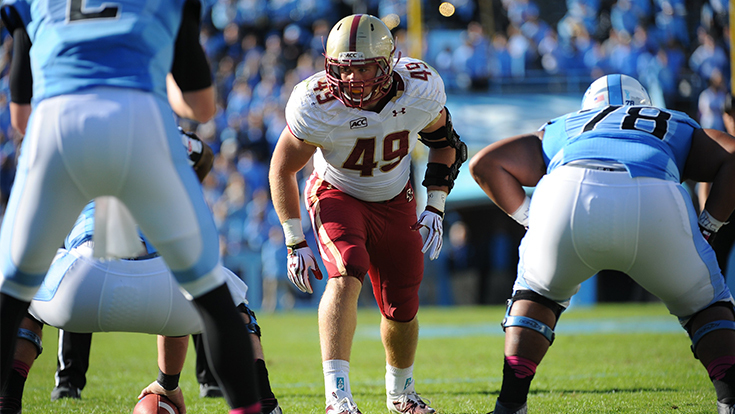 His prowess caught the attention of Boston College, where he began playing in his freshman year in 2010 and played in that season’s Kraft Fight Hunger Bowl. He would work his way into the starting role his sophomore year. As a senior, he was named to the third team of the All-Atlantic Coast Conference. After four seasons with the Eagles, he earned a training camp invite with the New York Jets. He ultimately walked away from the sport to pursue a successful career in commercial real estate. These days, he satisfies his competitive spirit by brokering massive real estate deals for his clients in the technology sector. 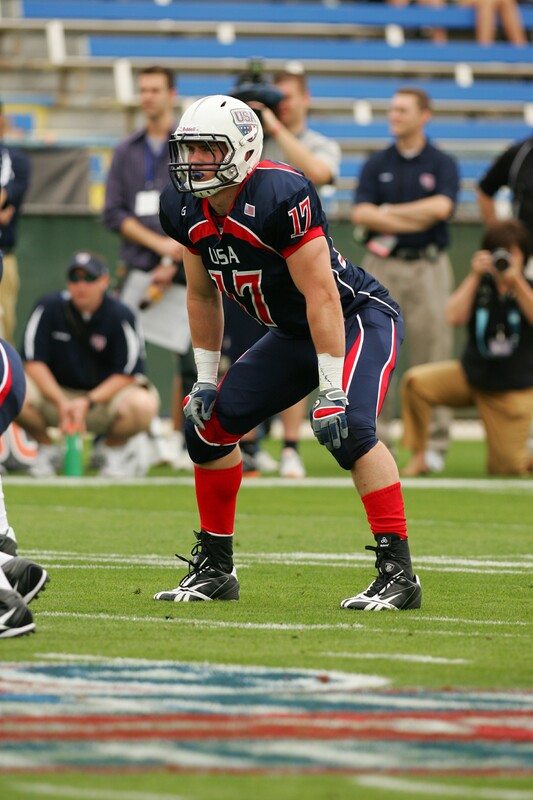 His path in life took him to many different places, including a spot on the inaugural U.S. National Football Team. He recently took his time away from his busy schedule to talk about what his experience on the team meant to him. EM: Do you remember why you originally wanted to play football to begin with? SD: Yeah, because I was too physical for soccer [laughs]. EM: Ahh, spoken like a true linebacker. Once you got playing, what made you fall in love with the sport? SD: Honestly, I think I fell in love with football halfway through my first season. I was out there playing defensive end and things just started clicking. I think the team aspect was the thing that I loved the most. There isn’t any other scenario in sports where you’re going out and really knowing that a guy has your back. There is a really cool bond that you make with people in football. You have people from different places and different backgrounds and they become your brothers. Also, it takes a lot of work to be great at this game and that’s something that is pretty cool. There isn’t one thing you can focus on to make you a great player. You have a lot of things you have to focus on. And, the game becomes more complex as you move up in levels. I like that portion of the game. EM: Did you always play on the defensive side of the ball? SD: Growing up, I played a lot of offense. I played running back, but in high school I only played defense. I played defensive end my first two years, my sophomore and junior year, and [my coaches] put me at linebacker my senior year. I really enjoyed playing that spot and that’s where I got recruited to play. Playing linebacker, you’re involved in everything on defense. You’re calling the plays, you’re making sure guys are where they need to be. I liked how you’re almost the quarterback of the defense. EM: What was the recruiting process like for you and what ultimately swayed you to attend Boston College? SD: My head coach in high school was who influenced me. He was someone who I had a lot of respect for. Both his sons went to Boston College, one played linebacker and the other played fullback. The academics were also incredible. To go to a top 10 business school in the country and play Division I football, especially one like BC that always plays phenomenal defense that was all stuff I wanted in a school. Football-wise, BC is tough and gritty and that’s my style of play. EM: Do you have any favorite memories of playing in Chestnut Hill for the Eagles? SD: I have a lot of them. We had a lot of good games when I was there, and we played in a lot of big, cool stadiums. We beat Clemson a few times and we beat Virginia Tech a few times. Playing Notre Dame was great even though we lost while I was there, which still bothers me. I think, my senior year we really pulled together as a team. EM: You had a training camp stint with the Jets. What was that experience like for you? SD: Yeah, I finished with BC and had workouts with the Patriots, Giants and Jets. I was a priority free agent with the Jets and I went through training camp with them. I started in May and got cut in August. I had the option to keep playing with Tampa Bay, but that’s when I decided to make the next move in my life and I got into the business world. EM: You also spent some time coaching high school football. Was that something you always wanted to do or is it something that sort of just happened? Do you have any plans to go back into coaching one day? SD: Yeah, I coached at Catholic Memorial [in Boston], which was a lot of fun. It was a pretty natural development and was a nice bridge in my career for me. I did that before I got into sales and it really was fun and I hope I can get involved in coaching again one day. EM: Can you talk about what you’re involved in now with T3 Advisors? SD: Right now, I’m in commercial real estate and I’m involved with technology, life science and robotics companies and help them build out their real estate strategies. It’s a very competitive industry. It’s a very team-oriented industry and I work for an awesome company with great people. It’s a lot of work, but it’s a lot of fun. EM: Would you say that what you’re doing now scratches that competitive itch that you had as a player? SD: The reality of things as an athlete is that a lot of times you have another gear that most people don’t have. In our industry, sales take a long time to develop, but when you score a big deal and it takes a long time you really appreciate it. I’d say there are a lot of transferable skills that I’m able to take from the field and apply to what I’m doing now. EM: Let’s talk about your stint with Team USA now. What was that week of practice leading up to the International Bowl like for you? SD: Well, you’re going against kids from all over the country, the elite athletes in your class and you want to go out and perform the best you can to match them. I played on defense with guys like Mike Hull who went on to play at Penn State and Tyrann Mathieu who’s in the NFL right now. Playing with those guys and competing with them in practice pushed me. EM: Not to say that you were ever short on it or anything like that, but did going out there with that group do anything extra for you in terms of your confidence on the field? SD: Yeah, playing out there with the best, it does put things into perspective and gave me a lot of confidence going into college. Being out there and competing with the top guys in my class was a really cool experience. EM: Did putting on the Team USA uniform mean anything special for you? SD: Putting on the uniform was awesome. For me, as an American, I don’t get the chance to go out and represent my country that often. To get the chance to go out and do that, to wear that uniform, it was really amazing. It was an honor for me. EM: Last thing for you, Steele. What would you say was your favorite part about your experience with the U.S. National Football Team? SD: I would say putting on that Team USA uniform. I mean, for me, football, family and America are three of the most important things in my life and to be able to go out there and play on that team, there was nothing better. To be able to go out there and compete with the elite in a sport that I love and play for my country in America’s favorite game, what is better than that?